As always, I'm scratching my head, trying to figure out what Mayor Emanuel's up to—in this case, with his proposal to raise the minimum wage. Pretty much everyone in America—or at least the Democratic Party—has acknowledged that raising the minimum is the right thing to do. If only so society's lowest-paid employees can eke out an existence. Currently, the national hourly minimum wage is $7.25; in the state of Illinois it's $8.25. Good luck eking out an existence on that. Raising the minimum wage has recently been endorsed by President Obama, Governor Pat Quinn, the Chicago City Council, and even Republican gubernatorial candidate Bruce Rauner—sort of. So naturally, Mayor Emanuel's got to get into the act. Governor Quinn's proposed to raise the minimum wage in the state to at least $10 an hour. Mayor Emanuel has proposed raising Chicago's minimum wage to $9.25. What's up with the 75-cent discrepancy? Alderman John Arena (45th), a member of the council's progressive bloc, thinks the mayor's trying to undercut Governor Quinn. "You got the governor trying to get people to sign on to at least $10, and here comes mayor with a lower number," says Arena. "So if the mayor's settling for less why should any legislator vote for more? Basically, he's undercutting the governor." So, in effect, he's assuring the corporate honchos he's got their back. And that he, not the governor, calls the shots. Oh, my goodness, Alderman Arena, that is just so cynical of you! For a different point of view, I turned to Alderman Ameya Pawar, who's working with the mayor on his proposal. He says Mayor Emanuel is being practical. That is, he's passing what he can pass now. As opposed to hoping for something that he can't pass. As if the mayor couldn't get the City Council to pass anything he wants! "Look, I hear what you're saying—not everyone's going to be happy with this," says Pawar. "But when you're at a point where nobody's happy with what you're doing, then maybe what you're doing is right." Pawar also points out that under the mayor's proposal the minimum wage would rise to $10.25 in 2015. And in ensuing years, increases would be pegged to inflation. There's also a third interpretation offered by Bill Drew, a faithful reader, who happened to call just after I got off the phone with Alderman Pawar. "He's doing both," says Drew. That is. He's undercutting Quinn—thus taking care of the big boys—while making a pitch to liberals and lefties. Just in time for the 2015 mayoral election. Dang, Mr. Drew—you're even more cynical than Alderman Arena. How about if we all just look on the bright side. This is a win for everyone. Big business holds on to most of its profits. 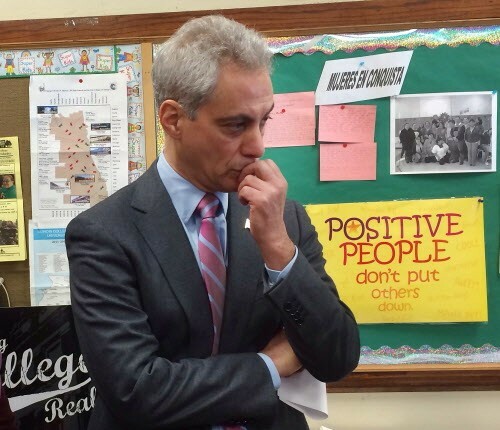 Mayor Emanuel rakes in more campaign contributions. And the guys on the line at McDonald's get that extra $1 an hour. Well, as you can see, some people win more than others. As if Mayor Rahm doesn't have enough campaign money, SEIU Local 73 gives him a little more with which he can buy the rope to hang the union movement.